If you only have time for one market while in Hong Kong, make sure it’s Temple Street Night Market. One of the city’s top 10 attractions, it always has a lively vibe, lots of energy, and entertainment on every corner. 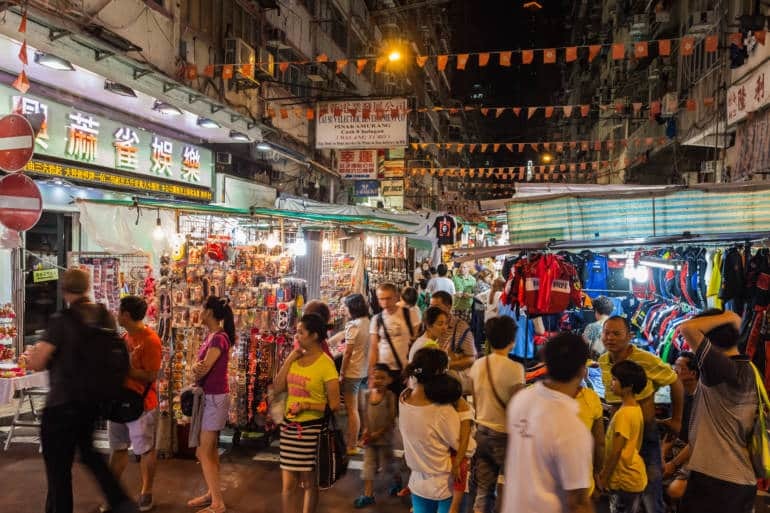 Stretching from Jordan north into Yau Ma Tei, Temple Street Night Market is a long strip with hundreds of stalls, which come to life every evening when the sun goes down. The best time to go is after 6pm—go earlier and you will find most of the stalls not even set up yet. Getting there is simple enough; take the MTR to Jordan Station, go out Exit A, and walk along Jordan Road until the see the large red gates, marking the entrance to the market. At street level outside the MTR station you can also look out for the ubiquitous pink signs, pointing you the right way. Temple Street is a great place to buy souvenirs such as Chinese-style bags and purses, chopstick sets, teapots, t-shirts, magnets and wall hangings. Fake goods are everywhere, from Gucci bags to Rolex watches, and you’ll hear vendors call out ‘copy bag?’ so many times you’ll start to think it’s your name. Haggling in Hong Kong’s street markets is almost an art form, which can be frustrating for tourists who are not used to it, so as a rule, just smile, make a counter offer, and if it doesn’t work, just walk away. Many of the shops will be selling the same items, so shop around until you find a price that you think it good. There are also many dai pai dongs or outdoor food stalls, specialising in fresh seafood, so pull up a plastic stool and enjoy a hot meal like the locals. Usually the stalls have English menus, which is helpful. Temple Street Spicy Crab, an iconic corner restaurant with a huge red crab on its sign, is very well known, and has been around for a long time. This is a great spot to to rest your feet, have a cold beer, and people watch. 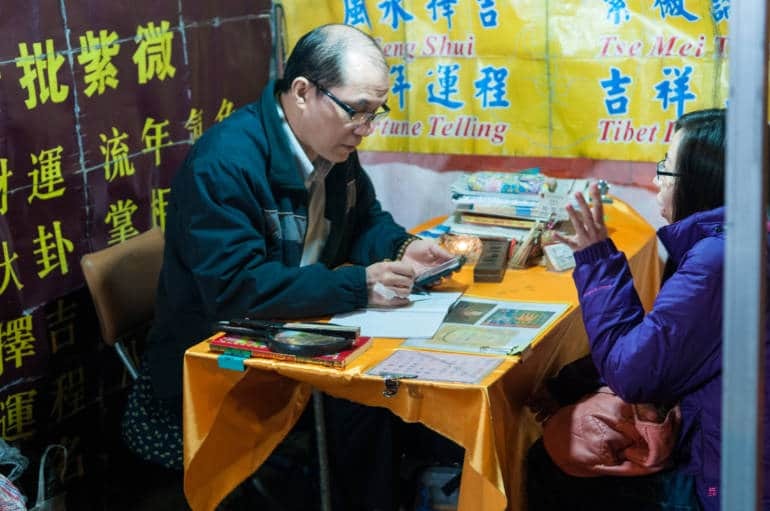 Around the Tin Hau Temple area you’ll find palm readers and fortune tellers, some of whom offer their services in English, but for something different you could leave your fate to a tiny bird in a wooden cage who will choose a piece of paper revealing your future. As you walk, no doubt your ears will pick up the high pitched whine of Cantonese opera being performed on a small stage. There are very few places left in Hong Kong where you can see traditional Cantonese opera without buying a ticket to a show, so be sure to catch this glimpse of the past. Drunken karaoke is also a fairly common sight later in the night. If you start from the south end of the market, by Jordan MTR Station, and walk north through the entire thing, you’ll end up close to Yau Ma Tei MTR Station, which means you won’t have to backtrack. Alternatively, Nathan Road runs right next to the night market, so after the market, look for a bus going to the Star Ferry, and take an evening stroll to admire the view of Victoria Harbour at night. Accessible, but crowded. Accessible public toilets not available on Temple Street, but are closeby, at Jordan Road Public Toilet, and Battery Street Public Toilet.